Its... a puzzle. The idea is to glue the pieces to the top and seal that with clearcoat lacquer. 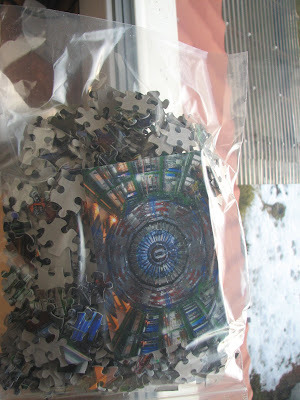 Since there is no official "CMS puzzle" I ordered a 600 piece one based on the photo here. Whether this will work - I don't know. So step one will be taking a part of the puzzle that's not going to be used (its oversized on purpose) and test the process on a scrap piece of wood. I anyway have time, since I still have to find the guitar that will be the base for this project.